One of my old classmates, Elvia Salazar Rivera, told me that her husband, SSG Jeff Rivera, just returned from a 15 month deployment in Iraq, and her their son, Pv2 Josh Rivera, is getting ready to deploy to Iraq. Please remember these Santa Anna folks that are serving our country in combat, training, or support: Brandon Beloat, James Culpepper, Eddie Dawson, Chaplin Delarosa, Kristle Deleon, Glen Donham, Reuben Frausto, Bobby Hale, Patrick Kerr, Truman Matthews, Jeff Rivera, Josh Rivera, Michael Ruth, Marty Siller, Allen Tucker, Scott Watson, Shane Watson, and Seth Wickson. Where has the time gone? It just seems just like yesterday we can remember you playing outside at grandmas house with all your cousins giving them all wedgies and playing in the rain & mud puddles. 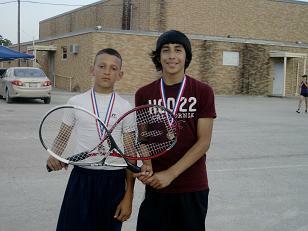 Then all your sports and activities that you participated in junior high and high school. Time goes by too fast. Look at you now. You've accomplished alot these last few months! You've always had a big heart and desire to do well in all that you do ... we've had you in our prayers while you were in boot camp at Paris Island, North Carolina and now stationed in South Carolina. We'll continue our prayers for your safety and pray for those who also serve and protect our country... we are so proud of you. We miss you very much and love you very much. May God continue blessing you in the Marine Corp!!! Something is going on around here. Is it just me or did you notice it too? Maybe I shouldn't say anything. Some might not like it. I don't want to start any trouble and I don't want to make anybody mad but something is going on and I am going to find out what it is all about. The economy is bad, people are out of work, why would somebody do it? I think it is the President's fault. No, I am not talking about George or Barack. The President of the Santa Anna National Bank is to blame. No, not my buddy Rob either, but he can have some of the credit if I can have some too! But I think it is Eddie Hedge's fault and I am going to prove it to you. Let's start with getting to the bottom of the latest event in town. 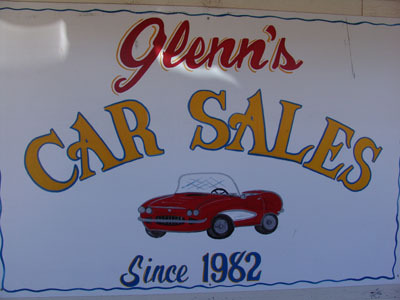 This sign had been taken down a couple of years ago from in front of the Texas Ranger Motel. It is what started the Stuff Page. I could not understand why a business built around visitors to Santa Anna would have it taken down. As I was driving home from work in Goldthwaite on Wednesday night, I noticed Corky McGee and Terry Taylor welding the sign back. The motel had been for sale. Did someone buy it? A phone call to the Motel later and I was told it hadn't changed owners but it has changed management. 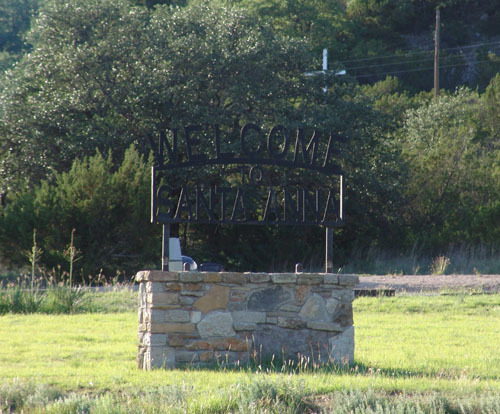 So once again "Welcome to Santa Anna" and welcome to the Texas Ranger Motel! The Class of 2009 of Santa Anna High School was honored Thursday, May 21, 2009, with a special senior recognition assembly, The Order of the Rose. Senior students were recognized for their achievements during the past year. Those honored included Layken DeLeon and James Ellerbe-- Class Favorites; Layken DeLeon and Lance Vasquez--Most Beautiful and Most Handsome;Kendra Coleman and Fausto Maldonado--Runners Up Most Beautiful and Most Handsome; Adelaida Dean and Lance Vasquez.--Most Likely to SucceedMaria Segura and Kolby Moon--Runners-Up Most Likely to Succeed ;Kendra Coleman and Frank Moreno.--Most Friendly;Marina Benge and Brandon Tate--Runners-Up Most Friendly; Molly Pritchard and Lance Vasquez--Miss and Mr. S.A.H.S. National Honor Society members recognized were Marina Benge, Adelaida Dean, Molly Pritchard, Caylie Robinett, Maria Segura, and Lance Vasquez. The honor graduates are Valedictorian Adelaida Dean and Salutatorian Maria Segura. In addition, Adelaida received the English and Science Department Awards, while Maria received the Social Studies and Math Department Awards. Individual class awards went to Kolby Moon and Dustin Ruth:--Ag Mechanics; Layken DeLeon-- Government/Economics; James Ellerbe--English IV-R; Kendra Coleman--Envivonmental Science and Spring Communication Applications; Maria Benge--Most Improved Speech and Pre-Calculus; Maria Segura--Pre-Calculus; Joanie Dean--Most Improved in Speech; Caylie Robinett--Fall Speech Award. Kendra Coleman was recognized as DAR representative. Student Council members recognized were Adelaida Dean, President; Lance Vasquez, vice-President; Caylie Robinett, Secretary; Frank Moreno, Treasurer; Layken DeLeon and Jimmie Ellerbe, Class Representatives. Receiving awards as class officers were Jessica Reece, President; Kendra Coleman, Vice-President; and Maria Segura, Secretary. Perfect Attendance Awards went to Kendra Coleman, Joanie Dean, Caylie Robinett, and Lance Vasquez. · Marina Benge: Mathematics, Number Sense, Calculator Applications, where she was 5th in district. · Adelaida Dean: Readywriting, Science, CX Debate and OAP. Adelaida was a member of the 2nd place speech team. · Caylie Robinett: CX Debate and One Act Play. Caylie was also a member of the second place speech team. · Molly Pritchard: Prose and OAP. Molly was a member of the second place speech team, 3nd in district in poetry, and at regional competition was the alternate to State. · Derek Tabner: Literary Criticism . Derek placed 6th at the district meet. After the senior video played, each senior received two roses. One rose represented the senior’s place in the Class of 2009; the second rose was given to a junior signifying the change from being a junior to a senior. After the senior recessional, the classes of 2010, 2011, 2012, 2013, 2014, and 2015 each moved into the position in the auditorium that they will occupy for the 2009-2010 school year. According to the school calendar this year's graduation ceremony will be held at Mountaineer Stadium on Saturday, May 30th at 8:00 PM. The Redmon's Hungry Indian Bar-B-Q restaurant and the Mary Ann and Billy Baker family in coordination with the Bangs Nursing Home is sponsoring a fundraiser for Relay for Life for Cancer research. We are having the fundraiser on May 30th at the Hungry Indian at 200 Wallis Ave. starting at 10:00am to 3:00pm. We are offering meal deals (including chopped barbecue beef sandwiches (cooked by Pat Redmon, chef for the Hungry Indian), chips, and a drink for $5.00. All proceeds going to the Cancer Society. Jason Watson of Coleman is starting a really interesting Blog featuring a Western Cowboy theme. I kept hoping our cemetery workday would get rained out but the rains came later. Carl Langford got out early and had several piles of brush ready to haul when I got there. I got to haul brush with Mr. Black and my old coach Dean Bass. It was all we could do to keep up with Mr. Langford and Mr. Hipsher on the chain saws. It was especially nice to see Terrance Jackson out helping Manuel Salazar. There were probably fifteen or so in all and all are appreciated. Special thanks to Dickie Horner for letting me borrow his trailer and to Mr. Fahrlander for bringing out his backhoe. Tex Wright reports 1.8 inches of rain over Saturday and Sunday. I poured out an inch and a half or so Sunday evening. Memorial Day looks to be hot and steamy with 90 degree temperatures forecast. I wanted to take a minute of your time to say thanks. Especially to those of you that have been sending news items to me. I really do appreciate it. You are the reason that I still do this. Several have asked me lately, if I was, "... doing pretty good" or "making some money" with the News. Fact of the matter is it costs me money to do this. It is a trivial amount especially since I get a lot of satisfaction from it and it keeps me out of trouble... sometimes. I have only been threatened with lawsuits a couple of times! If you see an advertisement here it is free gratis and always has been. I do this for the good my hometown and it's people... just as I have done from the start. I want to shift gears for a minute to this weekend. I moved the Cemetery Workday Notice back up here to the top... see it below. I know that it is a short notice but what better way to start the Memorial Day weekend than taking care of our Cemetery? According to Carl Langford, the Santa Anna Cemetery Association Historian, the Santa Anna Cemetery has 280 veterans buried in the cemetery. Of those 280, 28 are Veterans of the Confederate States Army (Confederate States of America), 3 are veterans of the Spanish American War, 69 are veterans of World War I, 122 are veterans of World War II, 19 are veterans of the Korean War, 6 are veterans of the Vietnam War, and several others that have served our country including 2 Texas Rangers. At least two were killed in action. It is difficult to tell how old some of them are or when they died because some of the older stones did not have any dates. 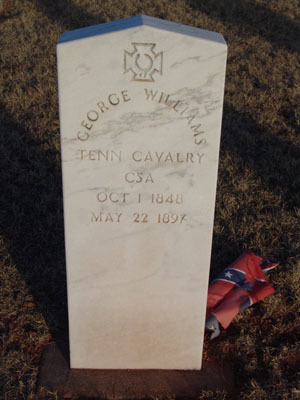 The oldest dated veteran stone is of George Williams of the Tennessee Cavalry CSA born Oct 1 1848 and died May 22 1897. All branches of service are represented including the Merchant Marines and except for the Coast Guard. The lowest ranking is of course a Private and the highest ranking are three Captains, four Lieutenant Colonels, two Colonels. I am really excited about the work being done at the Cemetery. We still have a long way to go and it will never end until we are out there too and then it will be up to those we leave behind to take care of us. We hope to get the fence lines cleared at this workday. I am just about finished photographing and cataloging the monuments has been finished by Mr. Langford. I hope to get them both online soon. We also want to start soon restoring some of the over 20 broken, over 50 fallen, and over 300 leaning stones. If you are interested in this project let Mr. Langford or I know. I also recently presented the Santa Anna Cemetery Association Board of Directors with an application for a Texas Historical Commission Historic Cemetery designation which is a first step to getting a historic cemetery marker and participating in the RIP (Record, Investigate and Protect) program. The RIP program will provide us with more help and information from THC experts about preserving our cemetery. Come and spend your Memorial Day Saturday doing something at the Santa Anna Cemetery that makes you feel good. Friday, May 22	Slammers @ Goldthwaite vs Goldthwaite 7:30 p.m.
Saturday, May 30	Slammers @ Goldthwaite vs Goldthwaite 10:00 a.m.
Tuesday, June 2	Slammers @ Santa Anna vs Early 7:30 p.m.
Thursday, June 4 Slammers @ Santa Anna vs Goldthwaite 7:00 p.m.
Saturday, June 13 Slammers @ Santa Anna vs Early	10:00 a.m.
Tuesday, June 16 Slammers @ Early	vs Early	8:00 p.m.
Thursday, June 18 Slammers @ Goldthwaite vs Goldthwaite 7:00 p.m.
Monday, June 22 Slammers @ Early	vs Early	8:00 p.m. Please come support our athletes and congratulate them on a Great year! And it was one for the record books! 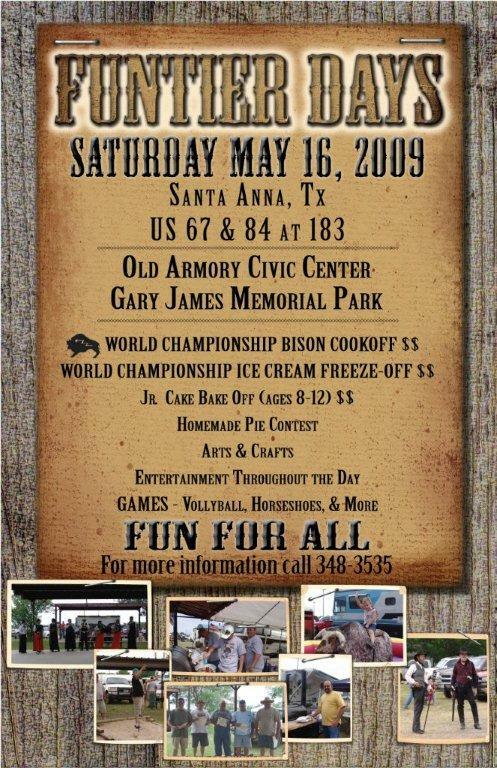 Santa Anna’s 15th Annual World Championship Bison Cookoff saw forty teams throw down their best efforts on Saturday, May 16. 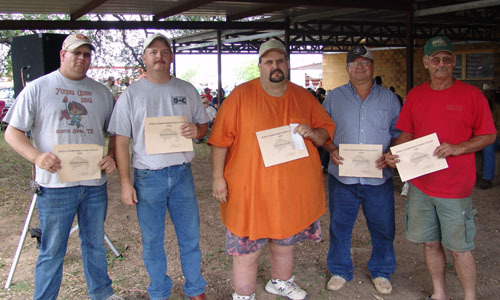 They came from west of Odessa and east of Waco, from Sonora, Granbury and from south of San Antonio, making the air heavy with the smell of mesquite smoke as they grilled everything from chicken to buffalo. And, as one of the cookers from Stamford said, "The wolves are here." The friendly competition was fierce until the camaraderie of the awards ceremony wrapped up the World Championship Bison Cook-off under threatening skies late Saturday afternoon. For all their efforts, the forty teams split $4500 in prize money. 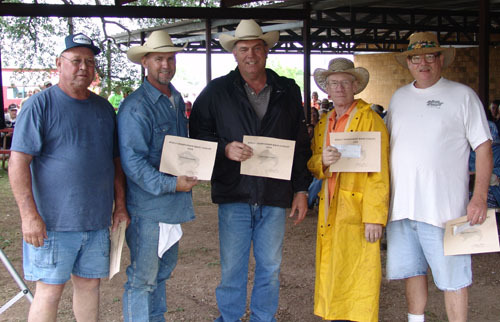 $500 First Place money for Bison Brisket went to Sonora’s Kirk Joy, edging out Gene Pruett of Granbury, who also boasted second place beef brisket and third place chicken. Sonora’s Joy also cooked the second place pork spare ribs. 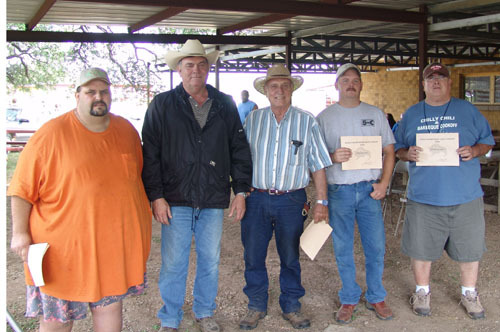 Local wood-burners Doug Tucker, Ross Bradley, and Tim Perry all took home placing ribbons, with "Boss Hog", David Huggins, taking local bragging rights for Best Beef Brisket in Coleman County. 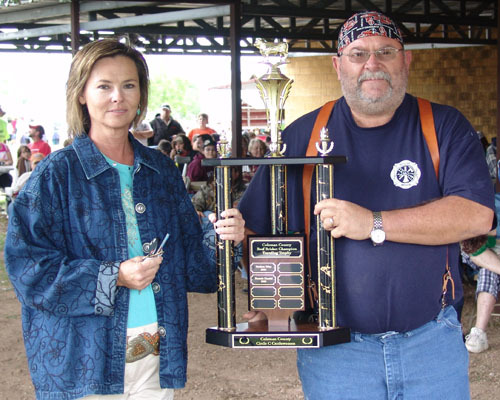 The Circle C Cattlewomen of Coleman County sponsored the 3-foot tall trophy and the $200 prize money for best county beef brisket. 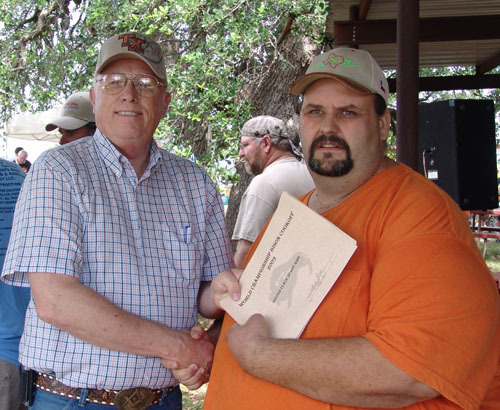 Coming in from Midland, Joe Crawford won the beef brisket category and placed third in ribs, garnering enough points to edge out Granbury’s Pruett and seize the Overall Points Championship and an extra $200. In addition, since the event is an official State Championship, Joe is eligible for an invitation to the American Royal Invitational in Kansas City and the Jack Daniel’s Invitational in Tennessee. Several other familiar faces made the walk to the winner’s table. Dickie Cooper from Stamford made the trip in all four categories, taking third-place in brisket and sixth place beef brisket. Gary Shook of Lamesa came forward twice, as did Don Campbell of Rule and Robert Bredemeyer’s team from Sweetwater, "We Don’t Cook Sheep". 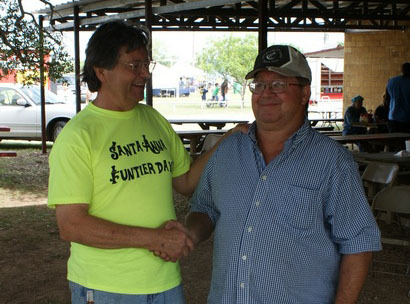 Robert Webb of Sonora was bested by his father Wayne for fifth and fourth place chicken. 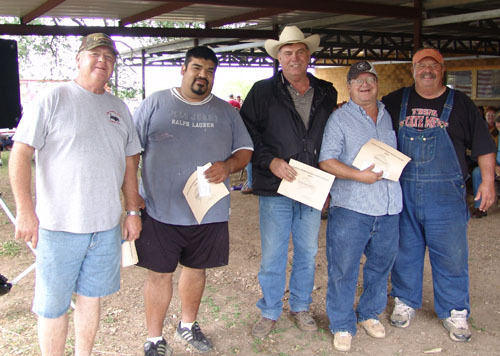 The large crowd, estimated at over 4000, benefited from the efforts of some of the best cookers in the Southwest, passing through a serving line at lunch set up under the Armory oaks. Visitors were dished up plate lunches of buffalo brisket and all the trimmings, while all around, Gary James Memorial Park played host to everything from arts and crafts vendors to horseshoe pitching and softball. The Santa Anna ISD Board of Trustees will be hosting a reception honoring Roger Walker for his service to Santa Anna ISD. 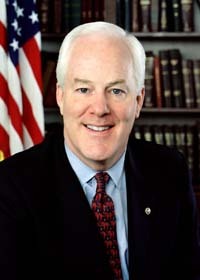 Mr. Walker served as superintendent for Santa Anna ISD from 2001 to 2008. 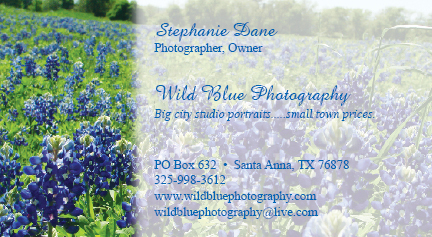 The reception will be from 3:30 to 5:30 p.m., Monday, May 18, 2009 in the Library of the Santa Anna Independent School District Administration Building located at 701 Bowie, Santa Anna Texas. On Tuesday, May 19th and Wednesday, May 20th, Coleman County Telephone Cooperative, Inc. will be performing some equipment upgrades in the Mozelle (357) exchange. Customers in this exchange could experience interruptions in their telephone service during these two days. The areas that will be specifically affected are Elm Creek and Concho Park. Customers in these areas will experience periodic interruptions of service, which could last up to 4 hours. When the upgrades are complete the service should return to normal. If you have any questions, or your service is out for longer than 4 hours, please contact Coleman County Telephone at 348-3124. Customers in the other exchanges serviced by CCTC should not experience any outages due to these upgrades. The Class of 2009 of Santa Anna High School will be honored Thursday, May 21, 2009, at 10:30 A.M. with a special senior assembly, The Order of the Rose. Senior students will be recognized for their achievements during the past year. Can you smell the smoke yet? Awesome team work,way to go guys! Work is expected to begin in Coleman early next week (May 5 or 6) to upgrade ADA ramps. 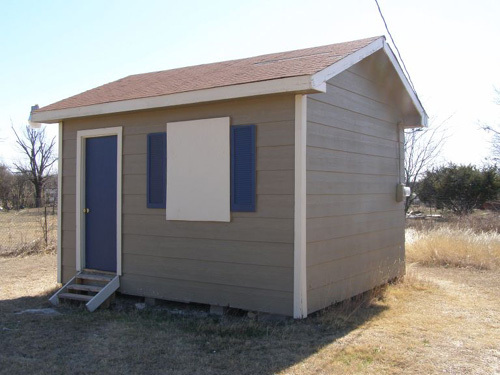 In 2008, the Texas Department of Transportation (TxDOT), with direction from the Federal Highway Administration (FHWA), began an Americans with Disabilities (ADA) project to bring all ADA facilities up to current standards statewide. Five of the nine counties in the Brownwood district will have ADA ramps built. Coleman County is scheduled for 133 ramps in all - 108 in Coleman on SH 206 and 25 in Santa Anna on US 67 and FM 1176. In some locations, existing ramps will be removed and replaced with ramps that are compliant with current standards. Lampasas Area Engineer, Tom Dahl, explains, "ADA ramps that were installed some years ago no longer meet federal standards and we will replace them with ones that do. 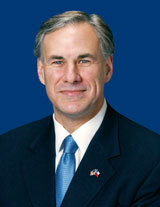 TxDOT strongly supports the ADA. Our mission is to work cooperatively to provide safe, effective and efficient movement of people and goods. We are committed to creating an open and accessible environment that benefits everyone." With specific guidelines to follow, TxDOT is required by law to remove all barriers that impede access and provide ADA compliant entries on all its facilities. ADA ramps are primarily found at road intersections and in many cases are not attached to a sidewalk. Ramps are required in areas where any pedestrian traffic has been observed or where significant potential exists for pedestrian traffic. Some observers call these “ramps to nowhere”, however, the intent is to provide a refuge area where pedestrians can get out of the roadway. The ramp removes obstacles for pedestrians who may not otherwise be able to maneuver past the curb. The Americans with Disabilities Act is a landmark law that protects civil rights and prohibits discrimination on the basis of disability. 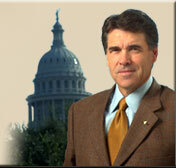 It is designed to ensure that all Americans have the same access to facilities and services. It requires that pedestrian facilities, used by a wide range of people, be planned, constructed and maintained to accommodate everyone. TxDOT is a strong supporter of ADA. With approximately 54 million disabled Americans in the United States, removing barriers and providing access to all facilities allows more opportunity for participation in every aspect of society. Lampasas area office will oversee the Brownwood district project. Interstate Improvement, Inc., of Fairbault, MN., was awarded the $1.2 million contract that is expected to be complete during the summer of 2009. My mom, Pat Wright, in a round about way is the reason I moved to and certainly at least one of the reasons I still live in Santa Anna. He was from Santa Anna... born and raised here. I think Mom was the first or maybe the second ever Avon Lady. We lived in Garland at the time and Mom was going door to door when she ran across this tall, skinny truck driver in one of the apartment complexes. He bought something from her... some aftershave I think. I think on the next visit he asked her out... Mom must have felt sorry for him because he obviously needed somebody to take care of him and feed him! All of this subject to correction of course. Truthfully he ended up taking care of us just like we were his own and I hope that he knows that I am forever grateful. We of course moved here in the Summer of 1975... to get us out of the big city. Mom has continued to work, mostly in the insurance business, and take care of us too. She is back in the cosmetic and beauty business as a BeautiControl Certified Independent Consultant. 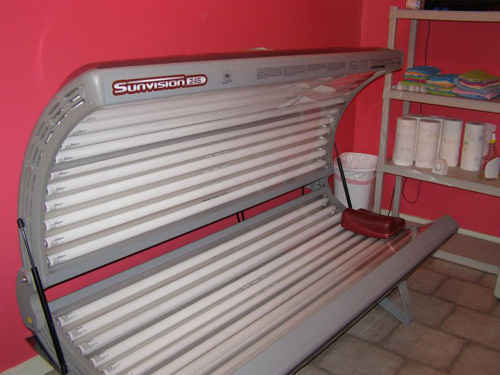 Take a look at her BeautiControl website and check out some of her really cool products and give her a call. She is really excited about it and I am too. I was mowing the front yard Thursday night and noticed a lot of traffic headed East on Avenue C... must be a game at the baseball fields. I got the water started after mowing. Jessica's dog, Chloe, and I were watching the cars go by and we noticed a lot of cheering coming from the park. Chloe had wanted to go for a ride for a while so I loaded her in the back of the truck and we headed down the street to see what we could see. What a crowd... cars and kids were everywhere! Time to move the sprinkler so we made a loop around the armory and headed back home. I got out and let Chloe out of the back. Cindy had bought some dog food earlier so I opened up the door to get it out and Chloe jumped in and then up to the front passenger seat. She would not get out! So I left her there for a while and took the dog food into the house. I opened up a can and took it back out to the truck. "Are you hungry? ", I said as she licked the can. She never budged from the seat. About that time my neighbor, Stephanie Fitzpatrick, pulled into her driveway. "Will you take my dog for a ride? ", I said half serious. "Sure", Stephanie replied with curious hesitation. "She won't get out." I said. Stephanie laughed and went on. I got back in the truck and Chloe and I went out for another ride. Past the baseball fields as they turned off the lights. There was Ray Jones, coach of the Slammers. "How did you do?, I hollered out the window to Ray. "We did good... especially that last inning. ", Ray replied. I knew the girls from Early were going to be good. One of the ladies I work with has a daughter on the Goldthwaite team and told me earlier this week that the Early girls were good. That should make the Santa Anna Slammers and Goldthwaite game Friday night a pretty good game. Back to Chloe, asleep by now with her head on the arm rest. I headed out past the Cemetery with the windows down... she never moved. I think she might have been snoring by now. We headed back home and pulled into the drive and there was Cindy on the front porch wondering where we had been. "I took Chloe for a ride... she jumped in and won't get out...", I said half irritated by now... "see if you can get her out..."
A little sweet talk later, Chloe was out of the truck wanting to be fed and put to bed. Leave the dog at home, load up your lawn chairs, head over to the baseball fields this Friday night, and give the Santa Anna Slammers some support. I will see you at the game! Cindy and I drove through Mozelle and by the old Mozelle School the other day on a round trip loop to Gouldbusk. The old school is about gone. I remember playing basketball in their gym. The gym at Lohn reminds me a lot of the old Mozelle gym. Cindy's Great Aunt, Maxine Cope, adds, "Terry Nanny is our main speaker for the Historical Commission program tomorrow (Thursday) night at Heritage Hall. Her name was left off and she has done a lot of research preparing for this program on the town of Mozelle. I hope you will be able to attend also." The Annual Pond Management Seminar will be held on Thursday, May 21st at the City Park in Coleman. Registration will be at 8:30 a.m. and the program begins at 9:00 a.m. A noon fish fry for participants will conclude the program. Three (3) hours of Continuing Education Units (CEU’s) will be awarded to private applicator license holders with 1 hour being in Integrated Pest Management, 1 hour in Laws & Regulations, and 1 hour in General. This year’s seminar could not be possible without the cooperation and sponsorship of area businesses and organizations. Sponsors include: Johnson’s Feed Barn, Purina, Central Texas Farm Credit, First Coleman National Bank, Santa Anna National Bank, Coleman County State Bank, Central Colorado Soil and Water Conservation District, Natural Resources Conservation Service, Davis Farm and Ranch, Coleman Grain, Dubar Seed and Texas AgriLife Extension Service. Please R.S.V.P. to the Coleman County Extension Office at (325-625-4519) by 5:00 p.m. , Tuesday, May 19th so an accurate head count can be made for the meal. Come to Heritage Hall on Thursday Night and hear Virginia Jamison and others from the Mozelle Community tell about the origin and history of the Community. We will offer snacks and conversation starting at about 6:30PM the program will start abouy 7:00PM. We invite all Coleman County residents, their friends and neighbors to come enjoy this program. Remember - 6:30PM - Heritage Hall - 400 College Ave - Coleman Texas - May 7, 2009. Happy Anniversary to my girl friend for life! Cindy and I have been married for twenty seven years... May the first. Seems like yesterday and forever all at the same time.